Played a key role in an early WWII battle bombing shipping. Despite its age, still the bomber with the highest performance. Once the “wonder bomber”, but surpassed in seven years. Boasting two 1,000 hp engines, powerful for its time. Is that the ghostly image of a Civil Air Patrol insignia? One combat loss, on March 1, 1942. The plane is a Glenn Martin 166 WH3, c/n 791, delivered to the Royal Dutch Army Air Corps (ML/KNIL) in 1940. This particular machine was captured by the Japanese on February 15, 1942, on Sembawang Airfield near Singapore. 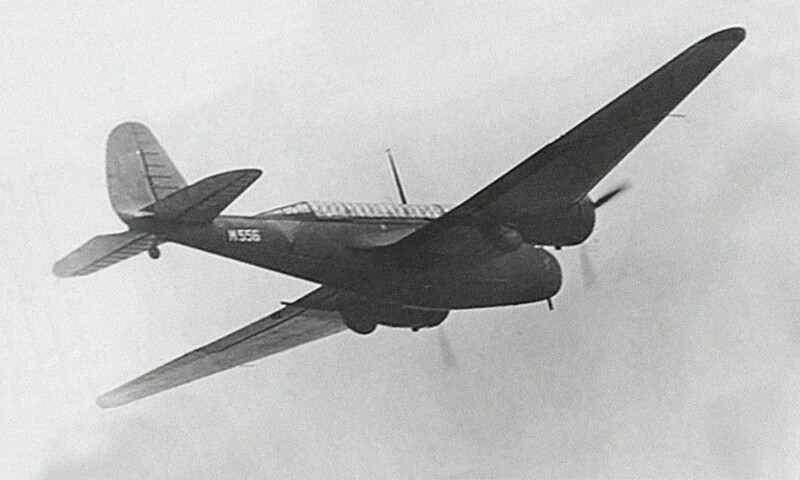 The Dutch government bought 120 of the export version of the Glenn-Martin B-10 in the late 1930s as it was then one of the fastest and most advanced combat aircraft available. However, by the time the squadrons in the East-Indies were fully equipped with the B-10, the plane was already obsolete. The design was overtaken in the technology race then underway as evidenced with ever newer generations of single engine fighters. When the Japanese attacked Malaya, Singapore, and the NEI, the Dutch strategy of destroying the invasion fleet from the air proved to be a fatal miscalculation. When the B-10s first went into action, they were not escorted. Not surprisingly, they were met by swarms of fast, heavily armed Japanese fighters. Only a few of the bomber crews were able to release their bombs on their intended targets. As a result, only a few ships were damaged and even fewer were sunk. By March 1942, the Dutch bomber force was decimated. The final mission came on March 1, 1942, when the last three operational Glenn-Martins took off to raid a Japanese invasion convoy off Eretan Wetan, Java. None came back. I have posted a brief history of the Dutch Glenn-Martins on my blog under ‘Background Information – Aircraft’, as a tribute to those who went to war in these machines. They knew that their chances of survival were almost nil — they went anyway.